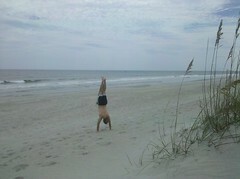 This is the first handstand I didn't have to find on the map. It was taken on my Android cellphone and was already geo-tagged! Awesome! We got to this beach after paddling over the 3 miles to get here, very awesome.